I’m not eschewing research (on the contrary, you can mine some great insights from it), but overly rely on it and you’ll have no idea how to achieve that wonderful magic that communications is founded on. Unless the comms answer is bloody obvious, of course. Which it rarely is/should ever be. To extend the aphorism – you can know you won’t get pissed on today, but will you need that umbrella tomorrow? *And on that note, I’ll see you guys in two weeks time. No valuable build here, just congratulations on linking golden showers to research. 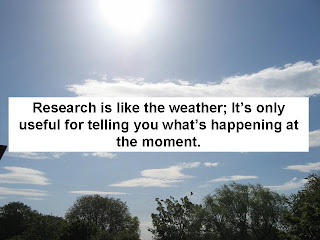 Oh, and the fact that I guess it depends on what we define as research…Have a great trip. Where are you going? What’s going on here? Marcus – I’m in Alabama/Louisiana for two weeks, visiting a friend here.Kirsty – yeah, it does depend on what you call research. Still like the thought mind (though hadn’t linked it to golden showers BEFORE reading your post.. heh). Well said. As true as true can be. Enjoy your holiday. Cant you forecast the weather? Baba – yeah, you can forecast it; but it’s not always wholly accurate.Rather like certain trend spotters some agencies employ – I think it’s a little bit of a white elephant.I think the weather analogy works well in the UK, at any rate; especially given the weather we’ve had recently.